Living… with his recently divorced best friend, Felix Unger, in 1970s New York. In modern times they might call each other “frenemies” because Felix, a neat freak, drives the slobby Oscar crazy. Profession… New York sportswriter. He's a cigar-smoking, poorly-dressed curmudgeon, so he fits right in when he plops down in the Shea Stadium press box to cover the Mets. Interests… gross food, baseball, and a nice cigar. He’s a guy’s guy who enjoys the simple pleasures. As soon as Felix brings up opera or Greek literature, Oscar tunes out. Relationship Status… divorced and loving it. If he weren't stuck with Felix he could sleep late and take off his pants as soon as he walked in the door. In other words, his life would be perfect. He still likes to date, though, as long as Felix can iron his suit for him. Challenge… dealing with Felix. After Felix's divorce, he showed up at Oscar's apartment and never left. Along the way he cleaned the place and provoked Oscar into hundreds of shouting matches and disagreements. Personality… messy, grumpy, and loud. He's the kind of guy who will wipe his hands on the closest available item. Unfortunately for Oscar, Felix is a tidy perfectionist who has no patience for Oscar's... resourcefulness. Sure, there's a lot of friction in their Manhattan apartment, but Felix needs someone to feed and Oscar is always hungry. Oscar Madison's popularity ranking on CharacTour is #3442 out of 5,000+ characters. See our top-ranked characters and read their profiles. 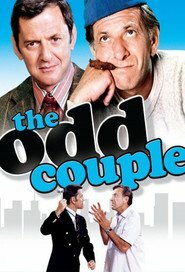 The Odd Couple is a television situation comedy broadcast from September 24, 1970 to March 7, 1975 on ABC. It stars Tony Randall as Felix Unger and Jack Klugman as Oscar Madison, and was the first of several developed by Garry Marshall for Paramount Television. The show is based upon the play of the same name, which was written by Neil Simon. Felix and Oscar are two divorced men. Felix is neat and tidy while Oscar is sloppy and casual. They share a Manhattan apartment, and their different lifestyles inevitably lead to conflicts and laughs. In 1997, the episodes "Password" and "The Fat Farm" were ranked #5 and #58 on TV Guide's 100 Greatest Episodes of All Time. The show received three nominations for the Primetime Emmy Award for Outstanding Comedy Series. Its fourth season, from 1973–74, remains the most recent nominee for a show that aired during a Friday time slot.